This is a “reprint” of the cover story in September 2016 FDTimes. Download this article as a 3 MB PDF. Here are two new, convertible, compact zooms from Thales Angénieux, in cooperation with Band Pro and Jebsen Industrial. 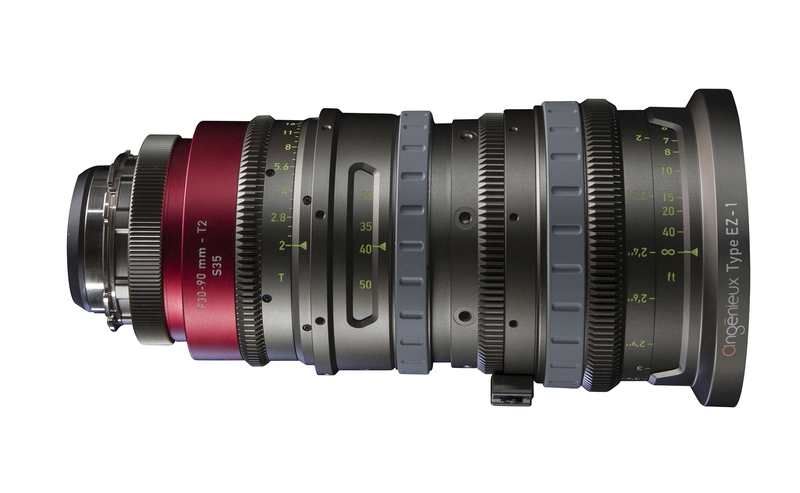 The new Angénieux Type EZ zoom lenses cover both Super35 and Full Frame/VistaVision. Their small size and light weight seem to defy physics. (Aren’t Full Frame lenses supposed to be at least 1.5 to 2 times the size and weight of their S35 counterparts? Not these.) The price defies tradition. This is a new paradigm for Angénieux: an affordable zoom lens filling the gap between the DSLR and Cinema lenses for the growing corporate, documentary and owner-operator markets. At IBC, Angénieux debuts the first two models. Angénieux Type EZ-1 is a standard 3x zoom. Type EZ-2 is a wide-angle 2.7x zoom. Both lenses have exchangeable rear lens groups and hence the ability to be swapped between Super35mm format (up to 30mm image diagonal) and Full Frame/VistaVision (up to 46mm image diagonal). The Angénieux EZ-1 covers a standard zoom range. It is slightly longer than a classic Angenieux Optimo 28-76 or Style 30-76. 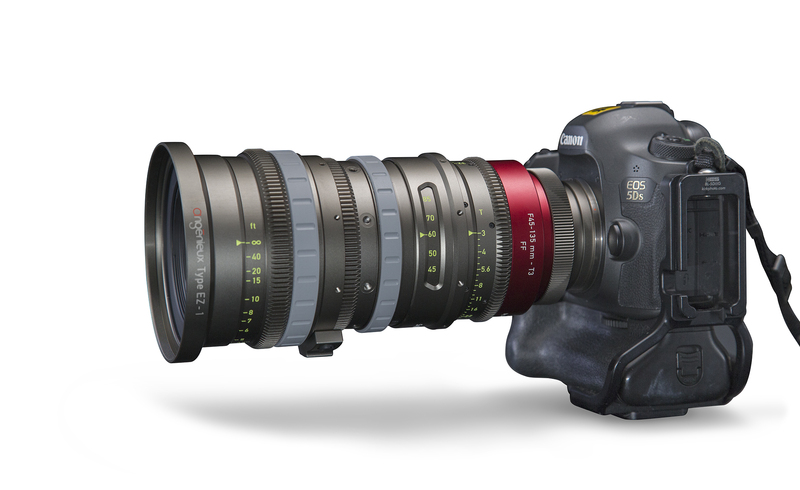 With the Super35 Rear Group attached, the EZ-1 is a 30-90mm T2 zoom. With the FF Rear Lens Group, it is a 45-135mm T3 zoom. The Angénieux EZ-2 covers wide angles. It is just a little bit longer than a classic Angénieux Optimo 15-40. When configured for Super 35, it is a 15-40mm T2 zoom. Configured for FF/VV, it becomes a 22-60mm T3 zoom. How can they do this? Angénieux has been building zoom lenses for 60 years—since 1956. They have a great deal of optical and mechanical design experience making compact and lightweight lenses. The concept of interchangeable rear groups is not new at Angénieux. The 44-440 T4.5 Anamorphic Zoom introduced in April 2016 has been a great success with rental companies because of its high quality and interchangeable rear group that can be swapped to convert it to a 25-250 T3.5 Optimo Style Spherical zoom. 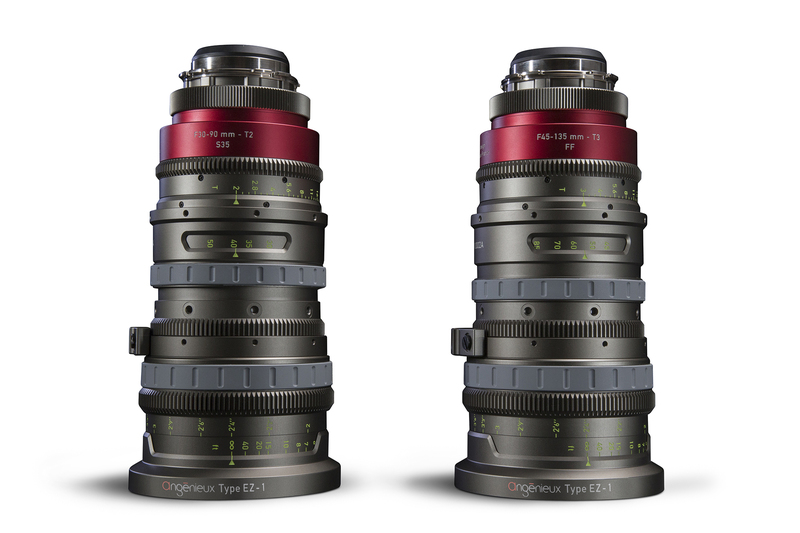 In 2012, Angénieux introduced the 19.5-94 T2.6 and 28-340 T3.2 with 31.4mm image diagonal coverage. These zooms featured not only new rear groups but also a redesign of the ever-popular 24- 290 T2.8 and 17-80 T2.2 which had smaller image diagonals. The technology of “speed boost” by reducing image coverage is at work in the new EZ series. Apertures normally unheard of in a Super 35 zoom lens are achieved: T2.0. Actually, apertures unheard of in a Full Frame / VV zoom are also achieved: T3.0 — in a size and weight that leaves us astonished. Both lenses have a full metal mechanical barrel, with internal thermal drift compensation. In other words, your focus remains constant as temperatures on location fluctuate. You may have to shed layers of clothing as the thermometer rises, but the lens maintains its parameters. Focus, iris, and zoom rings have familiar wide rotation and industry- standard 0.8M gear teeth. The lens length remains constant because focus and zoom mechanisms are internal. 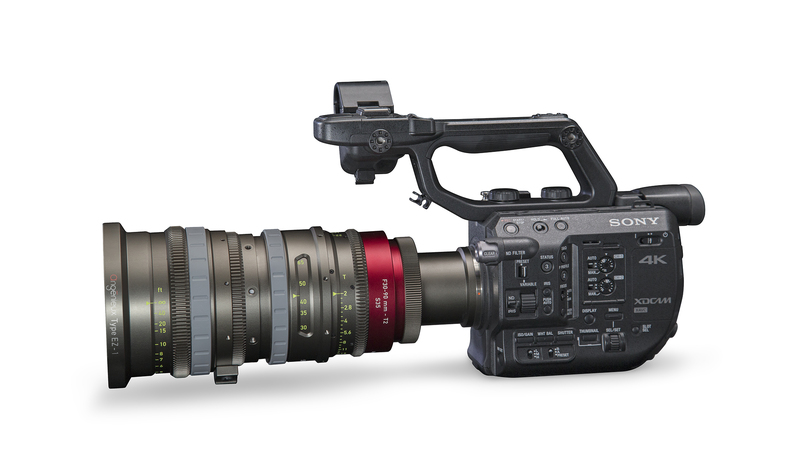 You can configure the lenses for S35 and FF/VV formats by swapping the rear group yourself. EZ Zooms come with PL mounts and you can attach EF or E mounts without returning the lens to a service center. EZ-1 deliveries are expected in the 1st quarter of 2017. EZ-2 should deliver in the 2nd quarter of 2017. Band Pro is the distributor in the Americas, Jebsen in Asia/Pacific, Angénieux France in Europe and rest of the world, and there will be a network of resellers. Prototype lenses will be shown at IBC 2016 in the Thales Angénieux and Band Pro booths. There have been many variations of the 35mm motion picture film format: Silent, Academy, CinemaScope, Techniscope, Super35, VistaVision, and so on. With digital cameras, it seems like the wild West. Camera manufacturers can conjure up almost any format they like. So, what is a lens manufacturer to do? If you’re Angénieux, you satisfy all existing permutations of 35mm and future- proof your lenses for any sensor size the camera companies may eventually create. There is no industry standard for 35mm digital camera sensor dimensions or even lens mount. Each camera model seems to come out with a different sensor size. So-called 35mm sensors can be anything from 22mm to 46mm image diagonal. The new Angénieux EZ Super35 series of zooms have a rear group that accommodates an image circle up to 30mm diagonal, which covers most motion picture cameras recording HDTV and UDTV video, and still cameras based on the APS-C format. The Angenieux EZ Full Frame rear group has an image circle of 46mm, which covers traditional full frame still photography format of 24 x 36mm (43.3mm diagonal), traditional VistaVision (45mm diagonal), the 8K RED VV 21.60 x 40.96 mm (46.31 diagonal) format, and anything larger than 30mm diagonal. Typically, when you attach a lens on cameras with larger or smaller imagers, the focal length and T-stop remain the same. For example, an Angénieux Optimo 24-290 T2.8 zoom on a 35mm PL camera is the same as on a 16mm PL mount camera. The wide end is always 24mm, and it’s always T2.8 wide open. The only difference is that the smaller 16mm format crops the image, and the field of view appears tighter compared to 35mm format. 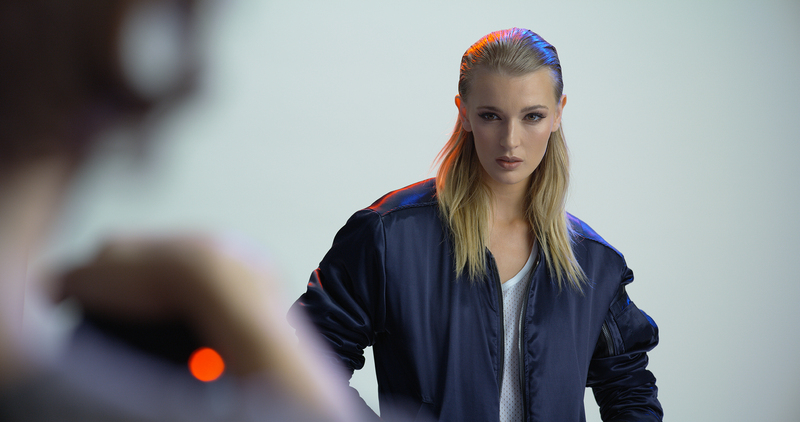 The Angénieux EZ lenses take a different approach. By adjusting the size of the image circle, the focal length is changed and you get a similar field of view in both S35 and Full Frame. Since the lens is concentrating the image onto the smaller target area of a Super35 sensor, the intensity of light increases. The initial design was developed by the Angénieux optical engineering group based in Saint-Héand France. During the course of mechanical design and fine-tuning the overall design for manufacturing, a fair amount of joint development work took place between Angénieux and a prominent engineering/manufacturing partner in Japan. To keep them affordable, the lenses are manufactured with a Japanese production partner who works in significantly high volumes and has been fully qualified by Angénieux. This helps to reduce the overall manufacturing cost. 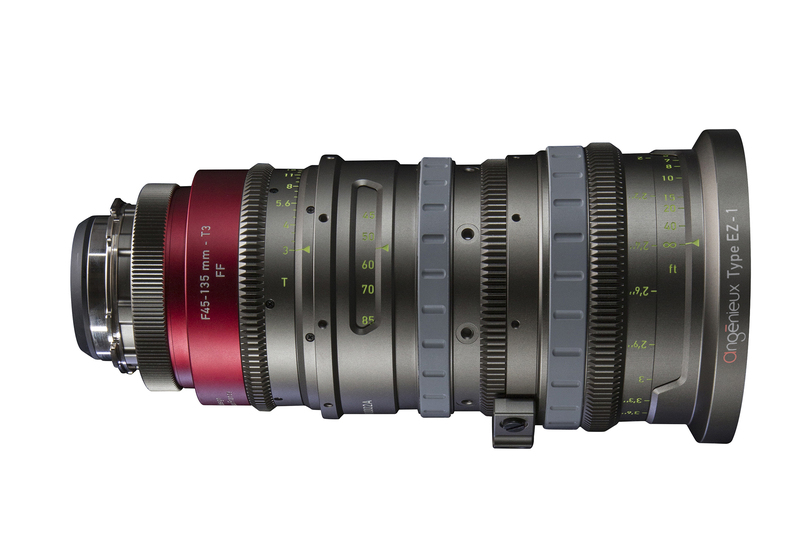 The traditional Angénieux Optimo and Optimo Style range are S35 format zooms. Their optical and mechanical performance put them in the high-end of production. 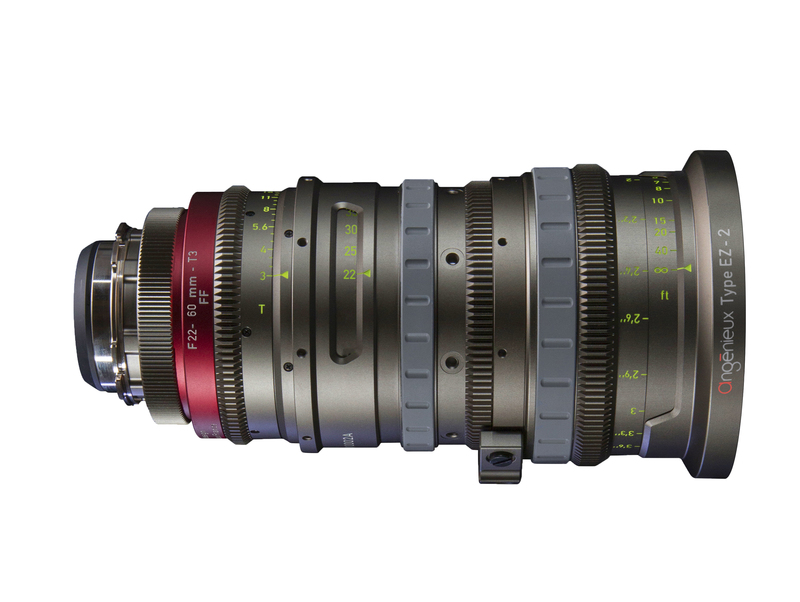 The new Type EZ range has been created to fill the gap between DSLR and Cinema lenses, addressing the growing corporate, documentary, video journalist and owner-operator markets. The EZ series was made possible by an optical formula that satisfied the fundamental requirements of both the S35 and Full Frame formats. They offer a compelling balance between quality, size, weight, and most importantly, cost. Full Frame EZ zooms fit which Full Frame cameras? The list will grow. 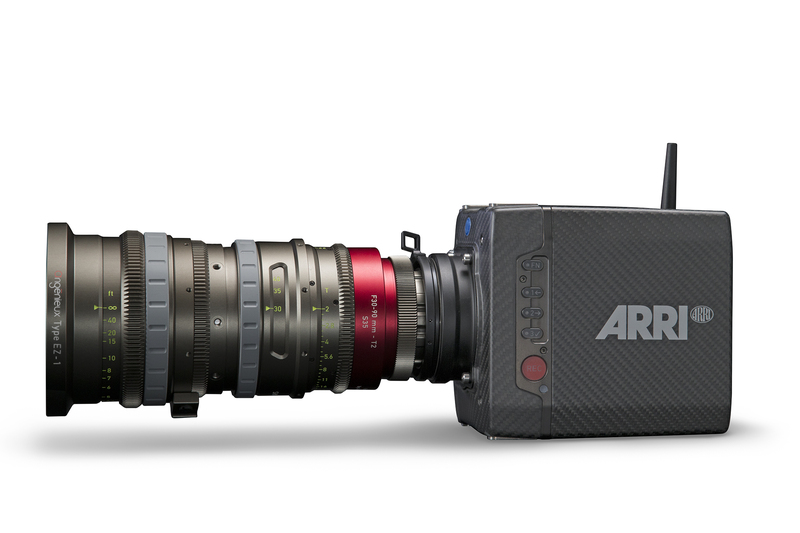 As of IBC 2016, EZ FF zooms cover these cine cameras: RED 8K VV, RED cameras recording at resolutions higher than 5.5K, ARRI Alexa Open Gate, ARRI Alexa 65 with Full Frame crop. They also cover Full Frame DSLR cameras, including: SONY a7S Mark II, Canon EOS 5D Mark IV, 5DS, 1D X Mark II, etc. Purchase S35 or FF or both? Initially, you’ll be faced with an agonizing choice. Which model should you buy? The S35 EZ series are some of the fastest zooms in the industry at a typically prime lens speed: T2. For a few dollars more, you can buy the EZ zoom as a package that includes both the S35 and Full Frame rear lens groups. Even if you swear never to shoot Full Frame Cine (never say never— it’s coming like a freight train) the FF rear group also acts as a 1.5x tele-converter. So, the EZ-1 30-90mm T2 S35 lens becomes a 45-135mm T3 lens no matter which format you’re in. The EZ-2 15-40mm T2 S35 becomes a 22-60 T3. With cameras so sensitive, why do we need a T2 zoom lens? Very shallow depth of field looks great. A zoom lens with such speed is rare, and normally the realm of primes. Aftermarket Speed Boosters attach to the mount of existing still photography lenses and do a similar job of condensing the field of view to S35 with an accompanying gain in speed. Image Expanders take S35 lenses and allow them to cover Full Frame. 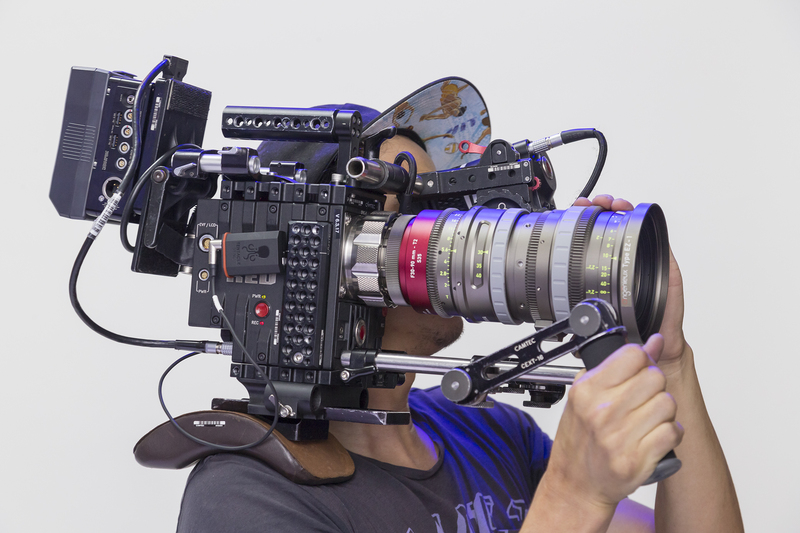 However, there are big differences between dedicated cine lenses and most DSLR lenses: quality of the mechanics, ability to maintain focus throughout zoom range, and angle of focus rotation. Type EZ lenses have a wide focus rotation angle of 300 degrees, compared with still lenses that can have as little as 30 degrees of travel. The rear lens group of the EZ series is dedicated and optimized for each individual lens. Excellent image quality is assured. The matching front and rear groups have the same serial number. 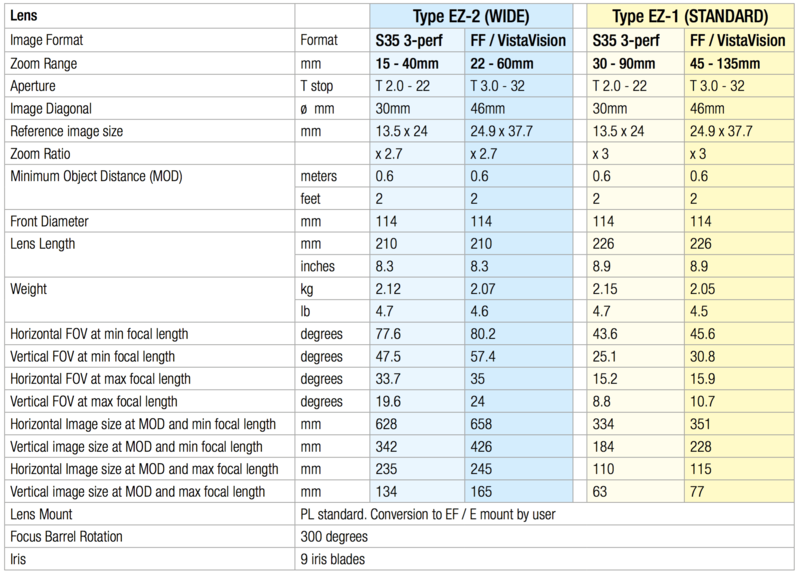 Changing between PL, EF and E-mount on the EZ is easy. Just unscrew the ring by hand. Checking flange focal distance is advised. Exchanging the S35 and FF rear group is simple and fast, but has to be done in a controlled environment where dust and moisture do not come in contact with the lens. Only standard tools are needed. Checking flange focal distance is advised here again. Conveniently, the focus scale remains the same for both S35 and FF. The zoom scale for the two different formats is changed by sliding the window in the lens barrel forward or back. The iris scale is part of the rear group. Randy Wedick is Senior Technical Consultant and DP at Band Pro. On August 8 and 9, he and a crew tested the Angénieux EZ-1 zoom in both S35 30-90mm T2 and FF 45-135mm T3 modes. 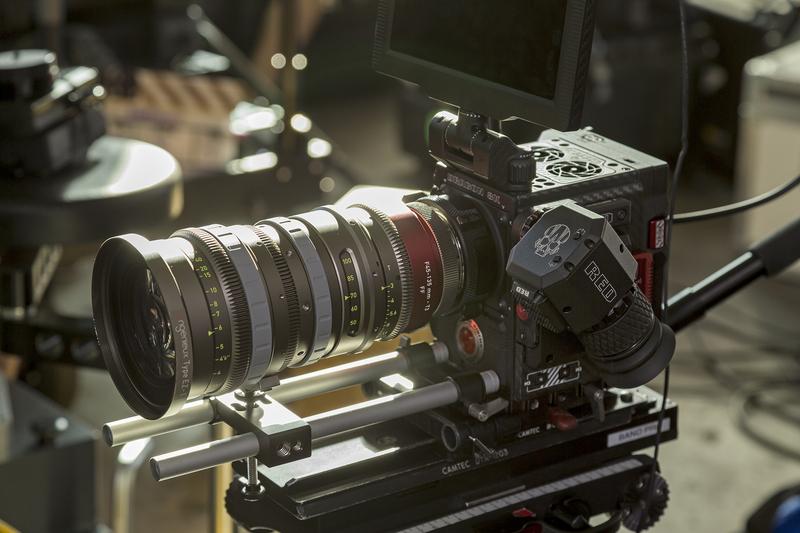 Jarred Land, President of RED, graciously lent his RED 8K VV camera. “The Angénieux EZ zoom is essentially designed as an affordable documentary lens, but its quality is highly cinematic. 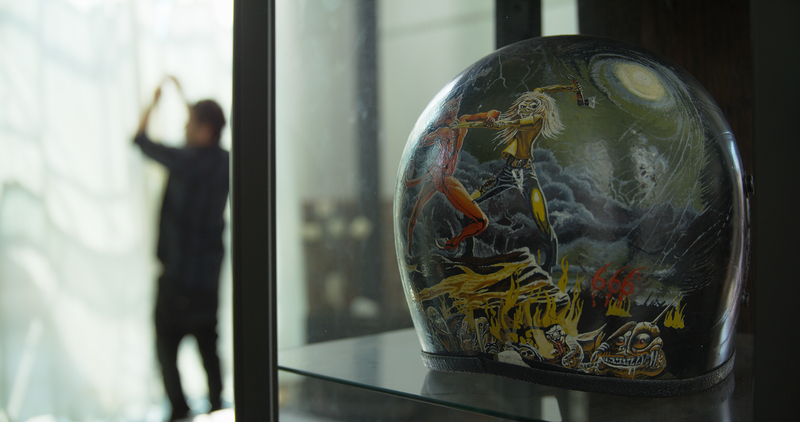 So we produced a cinematic documentary as the launch film for IBC. One of my good friends in LA is fashion designer Antonio Barragan. He’s built up a style that combines high-end European tailoring and handiwork with his rough and tumble southern California upbringing: military style tailored jackets remade with silk inside, python skin hot pants, post-apocalyptic motorcycle jackets— that kind of thing. He refers to them as “superhero clothes.” He’s dressed many bands, including the Rolling Stones, Lenny Kravitz, Janet Jackson’s entire tour crew, hip hop artists, and many more. He recently moved into motion picture costuming, working on Fast & Furious 8 and an unnamed superhero production. 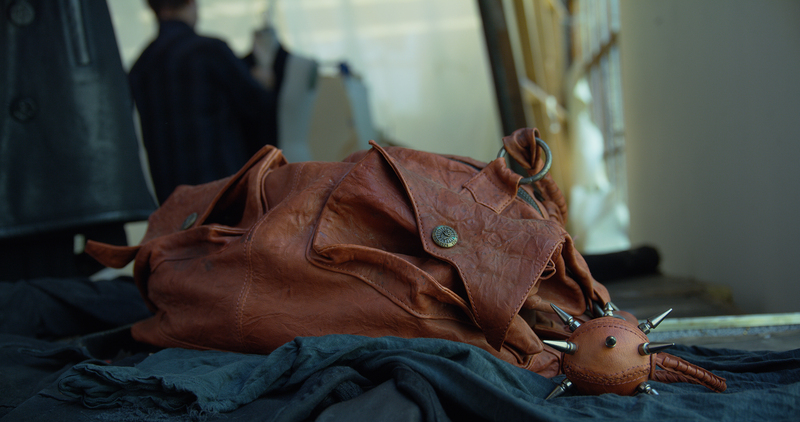 Our film combines interviews with Antonio, mostly voice over, as we follow him through the design and manufacturing process, and then working with models and a fashion photographer on a real fashion shoot, as well as portraiture and stylized product shots. We combined dolly, handheld and Steadicam moves. Steadicam operator was Aline Ballestero. Our model was Katrina Hunter. The lens has an interchangeable rear optical section that allows the use of either S35 or Full Frame/VistaVision cameras. 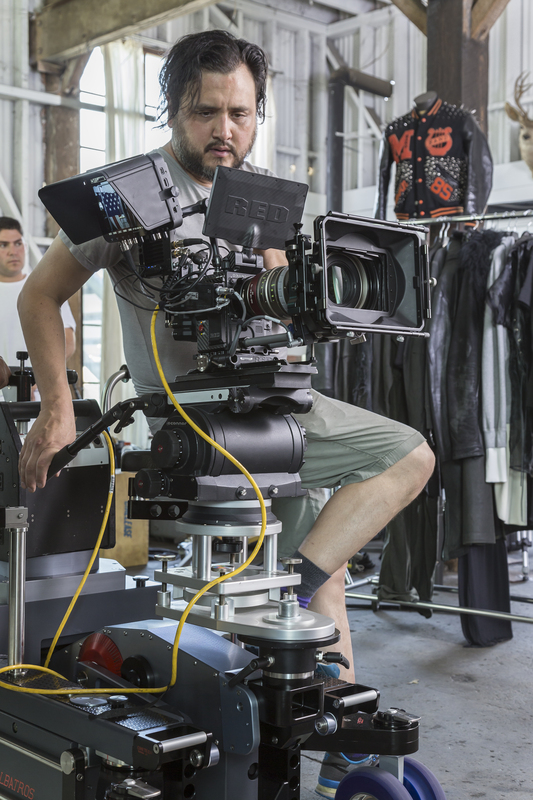 We used Jarred Land’s RED 8K VV camera and a 6K RED Dragon operating in 5K S35 mode. It’s very much an Angénieux lens. It has the color, look and focus fall off that we are familiar with from the Style and Optimo series. For certain shots, especially the interview segment, we were wide open and the look was pretty amazing for faces. There is a gentle and pleasing smoothing of the image wide open. There is a little bit of shading at the edges at wide angle and the focus fall off becomes softer. It’s quite nice. It’s almost as if they snuck a portrait lens inside of an all purpose zoom lens.